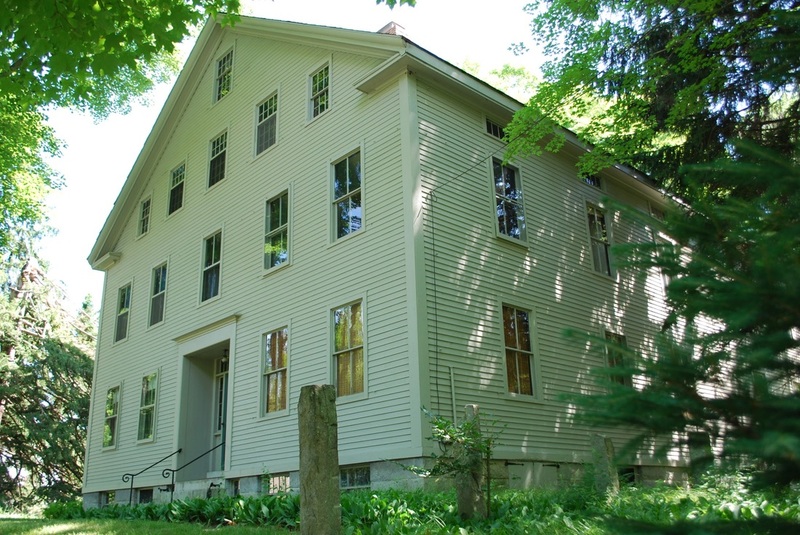 The New Office is an enormous clapboard building constructed in the 1840s to serve the Shakers’ growing interactions with “the World” when the community was thriving. It replaced the much smaller old Office, located to the south, (moved to Fruitlands in 1920.) This huge structure reflected the growth and prosperity of the village. In addition to new members, there was an increase in revenue through the sale of many agricultural and craft products, including packages of garden seeds, medicinal and culinary herbs, apple products, fruit trees, flat brooms, and other handmade items.Shaker Trustees, hired-help, and visitors lived in the 40 rooms of the building. The well-known Shakers, Elijah Myrick and Simon Atherton, lived here. Business was carried on in the lower levels. A kitchen and three dining rooms in the lower level served non-Shaker help and visitors. The Shaker sisters used one room as a retail shop, where they sold their “fancy work,” such as turkey-feather fans, knitted and woven clothing, dolls dressed in Shaker clothing, and decorated needlework boxes and needle cases. A door on the first floor is stenciled “store.” Some doorways are also stenciled with room numbers. The house shows the clean lines, simple design, attention to detail, and beautifully built-in cabinetry typical of the Shakers. It takes advantage of a slope, so that at the rear the basement and sub-basement are fully exposed; originally wooden steps along the south side gave access to the basement entrance. The roof is slate. The granite steps are original. The building remains essentially unaltered, although when the building was adapted as a summer residence by Robert Treat Paine in 1935 he added a fireplace. (Robert Venturi, a well-known architect, later modified the fireplace.) The Shakers themselves closed off the attic levels; originally the front stairway was flooded with light from a skylight in the roof. Later owners added a closet below the rear staircase. In the 1930s a rear wing was modified into a sunporch and garage —it was originally used as bathrooms. The second-story flush toilet was said to be the first in New England. In the current dining room, the large cylinder in the middle of the room is a chimney flue. The long table in the room came from the New Lebanon Shakers. The tailor’s counter in the living room has center drawer pulls and is said to be designed for a one-armed tailor. Hawthorne and Emerson visited the Harvard Shakers and are said to have eaten in the basement dining room. The novelist Thomas Wolfe thought about buying the house, saying he could write a chapter in each room.